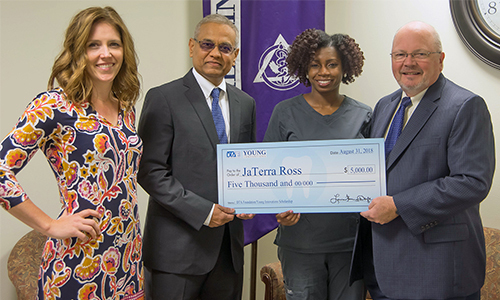 “In order for mankind to move forward, we must continue to give back.” That phrase is at the heart of the actions and aspirations of Southern Illinois University School of Dental Medicine (SIU SDM) fourth-year student Jaterra Castine-Ross. Castine-Ross, of Chicago, has been awarded a $5,000 scholarship from the Dental Trade Alliance Foundation in recognition of her impressive commitment to community service and academic excellence. SIU SDM faculty nominator Katie Kosten, DMD, assistant professor and director of community dentistry, says Jaterra’s professionalism and aptitude are impressive. Her path to dental school and her motivation for entering the dental profession, in particular, make her stand out. When considering a career path, Jaterra says she narrowed her choices to either teaching or dentistry. She chose dentistry because she says it offers the best of both worlds. “In dentistry, I not only get to help people with their confidence by improving their smile, but also I have the opportunity to educate them about how their oral health affects their overall health,” she explained. Jaterra has been actively involved in community engagement through volunteering at the Boys and Girls Club in Carbondale, participating in walks and donating time at events such as the Illinois Mission of Mercy, and providing free services with the Christian Dental Society during a mission trip to Jamaica. According to Kosten, service to others should be at the heart of any patient-centered profession. Photo: (L-R) SIU SDM Director of Community Dentistry Dr. Katie Kosten; Director of Operations with Young Dental Rajul Amin, representing the Dental Trades Alliance Foundation; scholarship recipient Jaterra Castine-Ross; and SIU SDM Dean Dr. Bruce Rotter.